API to Index Data & Perform Text Search in all Popular Document Formats using .NET Applications. Open NuGet package manager, search for GroupDocs.Search and install. GroupDocs.Search for .NET is a document and text search API for business applications developed in C#, ASP.NET and other .NET technologies. This .NET API supports basic to advanced search features, e.g., creation and merging of multiple indexes, searching through indexes using Simple, Boolean, Fuzzy, Regular Expression (regex) and other query types to fetch your required data, from files, documents and emails, through smart search.  If you want to build a fast, reliable, smart and feature-rich search application for your end-users, supporting all popular file formats, GroupDocs.Search for .NET is all that you need. An overview of .NET Search API for documents text retrieval. GroupDocs.Search for .NET API frequently uses index in order to perform search. Indexes are used to collect, parse or store data for fast and accurate searching. Create Index: Create Index folder and add/index documents to that folder. Load Index: Load an existing Index. Add Documents to Index: Add documents to existing Index, asynchronously. Update Index: Update existing Index, whenever a document is modified, added or deleted. This keeps search results up to date. GroupDocs.Search for .NET is able to merge multiple indices into a singular index. If an index is frequently updated, it has several delta indices, but this approach reduces search performance. GroupDocs.Search for .NET API merges all delta indices into one consolidated index. The primary merged index will contain all the information from the merged delta indices; however, the delta indices will remain unchanged. This approach used by our API considerably improves the search efficiency. Index merging feature, provides numerous functionalities to tweak to further tweak this process. GroupDocs.Search for .NET can cache text of indexed documents in an index. This cached text is then used to rapidly generate HTML markup by highlighting search results. This approach is lot faster than extracting text directly from files. Retrieving text from cache will be available even if the source files are no longer available. The cached text can be stored by applying various compression levels to occupy lesser disk space and faster indexing time. When you perform Fuzzy or Regex search, you can get the list of documents that exactly matches your provided input. However, you will also get a list of documents that contain words or terms similar to your input. For example, if using GroupDocs.Search for .NET, you perform fuzzy search for query “cost”, you will get documents containing word “cost” and documents containing similar words such as “coat”. The results will be dependent on what level of fuzziness you have configured using this API. GroupDocs.Search for .Net can recognize search queries written in a language that does not match your keyboard layout. Currently, this .NET API can successfully recognize 88 languages and 164 different keyboard layouts. GroupDocs.Search for .NET API allows you to search for various word forms. For example, for a noun you can search for its singular and plural forms. For a verb, you can search for all forms of that verb. You can also search for root, third-person singular, simple past and various other forms. For languages other than English, you can implement customized word forms.